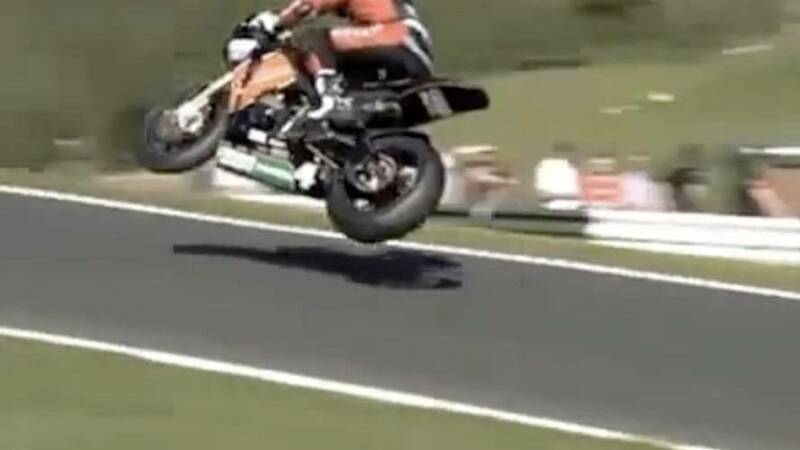 HM Plant Honda’s Josh Brookes has been wowing fans at Cadwell Park with spectacular jumps at the track’s Mountain. “I do it because its the fastest way I know how to get over there,” Brookes explained simply. “I go as fast as I can and as a result I get air borne.” Here’s video both from trackside and onboard. “As a bonus its fun and the crowd loves it,” Brookes continued. “I can see why people are scared to jump, it can go bad really easily. I know the years of motocross are an advantage. I know how to jump and not get to out of shape. “I go through the turns before the jump just like any other. On the up ramp to the jump I use a lot of throttle but more importantly I keep a lot of lean angle even though its going to be leaving the ground. I stay sat down until the take off point where I stand up as the bike takes off.